Tricia's Take: OOTD- Field Game! *my Old Navy swimsuit cover came and it's a little too long... I guess that's what I get for trying to make a sundress a swimsuit cover! I may hit up Old Navy this weekend and exchange it! This is such a cute look! Blue and red is my favorite color combo, and the boots top it off perfectly! Cute! Everyone looks so great in that sweater! Why was I so resistant to getting it??? And I love Monk too! I was so sad that it ended. And I'm like the only one but I really wanted Mr. Monk and Natalie to get together at the end: they would have been such a cute couple! nothing better than a red field game cardi! Monk was our favorite! We were so sad when it ended!! I just love this cardi...I've seen so many different styles with it and it always looks great! Enjoy your time INDOORS today. Love the whole outfit and the cardi is realy cute. I missed out on that one. Love that cardi with the buds and bunches tank! And gotta love Mr. Monk. Did I ever tell you that I saw Natalie when I was shopping at that kids boutique in LA? She was there with her son but I didn't say anything to her. This outfit makes me feel cheery!! 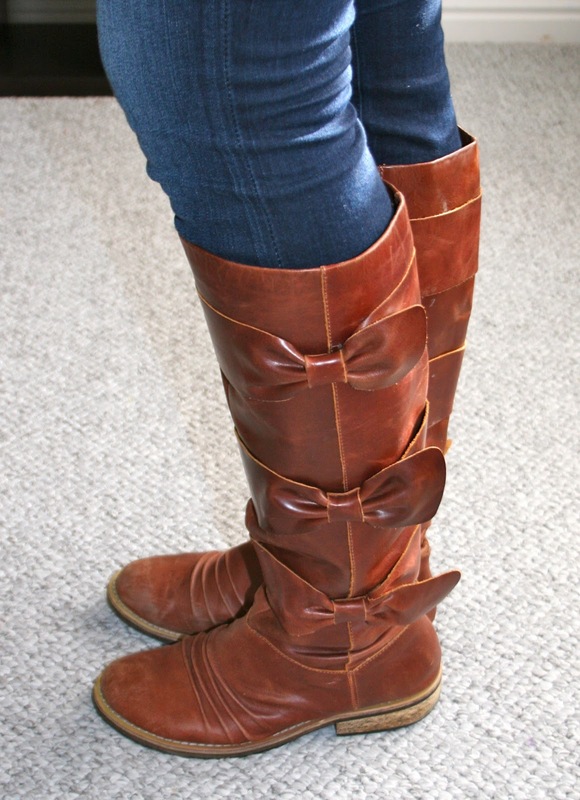 Love the boots of course!! I think the boots really make this outfit -- you are too cute! I really like you in red! The blue chambray-ish top you're wearing underneath the cardigan is such a perfect pairing, too! Yep, Monk is currently my favorite show too. This is such a great casual but stylish outfit. Oooh great color combination - this outfit is cute as can be! Pretty! I love all of the bright, cheery color! Love this outfit! I'm going to copy it if you don't mind. I think it would make a great Valentine's day outfit. I just bet every mom in town sees you with your kids and thinks, "That's the kind of mom I wish to be." I'm wearing my FG cardigan (knock-off) today. It really is a versatile piece. I passed on the red one and now I am kicking myself. Can't figure out why I did that!!! BTW, the black,white, and pink cardi that you're wearing in the previous post is so, so pretty. I almost gasped when I saw it! 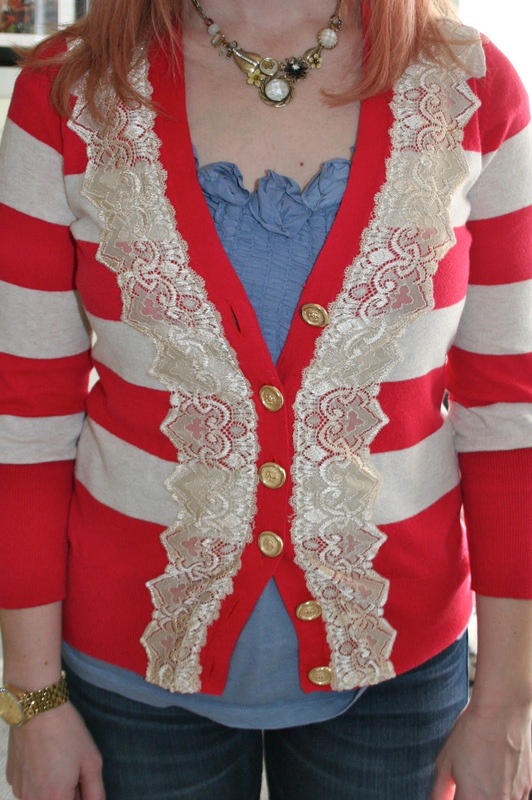 Love the cardi on you! Red is so your color! I love this ensemble and how great your hair looks with it.